The events was held last Saturday 25th June 2011, 6pm and the runners were given 18 hours to complete the race. Comparing the distance and the prize money, it is not well balanced. So Sefli win 2nd place and he got a crystal trophy, prize money of S$250 and S$300 NB vouchers. For me, the prize money should have been more, like S$2000. Then it is worth it. 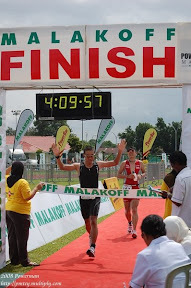 But the most important thing is the experience of running ULTRA Marathon. I’ve done the 84km and I would say it was a different kind of experience – totally different.